Coffee mugs are one of my favorite things in this world, they make me feel cozy and domestic. 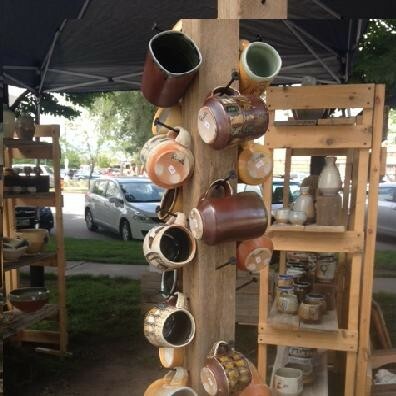 So naturally I pulled up to the tent to check out the lovely handcrafted products at Dead Mule Pottery. The mugs are stunning, the teapots adorable and the shot glasses are fun and affordable. But the most attractive items in my opinion is a matching line of pizza decorated dinnerware. I’ve never seen pizza dressed up so elegantly. “The whole reason behind my work is to slow down life a little," said the artist, Austin Riddle, "Handmade objects make your typical day to day something to experience. It heightens the moment and makes you appreciate it.” The prices for the pottery start at $5 working their way up depending on size and detail. I found vendor Matt Thomas sitting behind his tent rather than inside it, visible through some chicken wire he used to hang up his work. I then realized the reason he chose to shun himself from his own tent, to make room for his wide supply of products! Some of my favorite liquors have been turned into the most illuminating furniture. 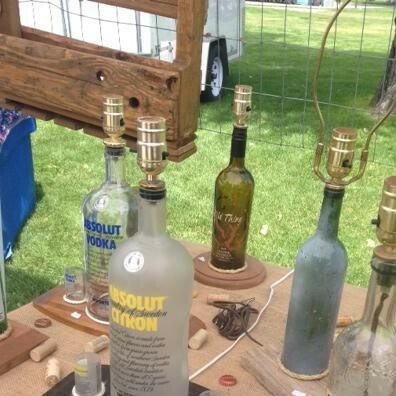 Absolute vodkas for the modern decorator, High West whisky for the shabby chic stylist, and smoky wine bottles for the wino who can’t find their shoes in the dark. You can further furnish your house with a bar theme in mind with recycled beer and wine barrels that Barhome Designs has transformed into desks and end tables. “I love up-cycling things. I love turning something you throw away into something useful, something that functions, said Thomas. His lamps begin at around $35 and his racks start around $45. Although he makes wine racks out of recycled pallets, I’m in the midst of contacting Matt and asking him to create a wine rack out of one of his large barrels either for my wine or for my beautiful lamp collection. 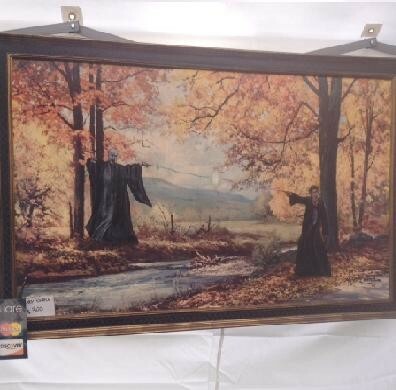 Kat Martin finds old traditional paintings that have been given up on at thrift stores and adds some of our favorite fictional characters into the work. “I love to make them loved again,” said Martin. Having a bit of an obsession with Harry Potter I was in complete awe at the Harry vs.Voldemort battle scene in the midst of a tranquil forest. For Star Wars fans, she has a four piece set featuring the golden encased C3PO. You can own one of these inventive prints starting at just $6. 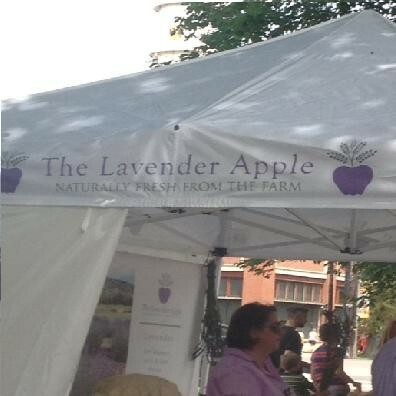 The Lavender Apple produces all things lavender under the sun. My mind was practically floating away with the smell of the Lavender Honey, truly one of the most soothing products imaginable. The honey that’s used is from the field next to the Lavender farm. Another product I thought was fascinating was the sachet. It’s like a small pillow filled with organic lavender and tied with a ribbon. Not only does it smell delightful but they keep moths away! Amazing. These items start around $5 dollars. The tent is a little intimidating because of the mob of people always gathered around it, but you should make the effort to force yourself in there because it is worth it! 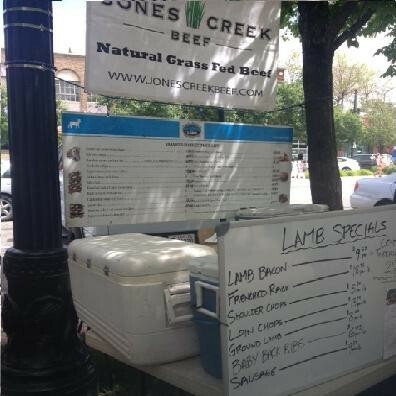 Being a conscientious carnivore, I always scope out the grass-fed meat options at the market and Jones Creek Beef is really doing it right. When I read the first line item listed on their specials whiteboard I fell in love, Lamb bacon! Considering how much quality bacon costs at the grocery store, I was expecting to see high prices for this, but at $9.25 a pound it's an absolute steal. I was drooling on my shoes instantaneously. Then I look onto the main menu board to see Jalapeño Cheddar Bratwurst, it was like opening the flood gates. Not only does Jones Creek know delicious meats, they know how to raise the animals humanely, boosting both morality and flavor, according to them. Natural meats tend to be lower in fat content and higher in nutrients, because of this fact the meat will cook differently than your Average Joe Meats. But not to worry, on the company’s website they have listed cooking tips to assist you in creating a tasty meal. Knowing it is grass-fed and free range was incredibly important to me. The company does, “what is best and right for each animal in its lifetime.” You can find Jones Creek Beef products at your local Wal-Mart, which really helps spread the organic, grass-fed meats hype to the masses.